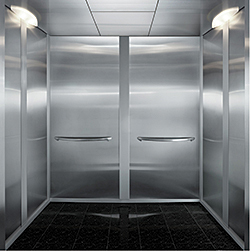 The Schindler 3300 eliminates the need for a machine room or a control closet. The machine room-less traction elevator's cabs are up to 5 percent larger than the average MRL cab, with a maximum capacity of 2,100 to 3,500 pounds, or 14 to 23 passengers. Has a maximum travel height of 98 feet, 5 inches with eight stops.